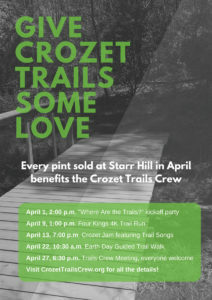 Starr Hill has named Crozet Trails Crew the beneficiary of its “Cheers for Charity”. In April, the Crew receives $1 for every pint sold. We’re kicking off the month with a fun and informative “Where Are the Trails?” party. We’ll have (short) talks introducing the trails, maps to hand out, a Trail Trivia game, and prizes. There will be a food truck, as well as (of course) beer. So head on over and Give Crozet Trails Some Love.